I was working at the Mueller Farmers’ Market last Sunday slinging cheese, and got to sneak away from my booth long enough to score some great fresh produce. 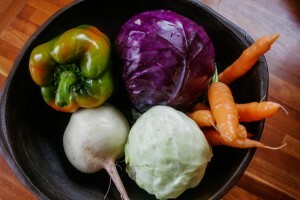 I got some very nice red cabbage, baby green cabbage, and carrots from Phoenix Farms, some beautiful watermelon radishes from Hairston Creek Farm, and some tasty bell peppers from Bernhardt’s Farm. Since my wife left me alone in the house with a brand new mandolin in the kitchen, I decided it was high time I used it. If there’s one kitchen tool that can make me cringe it’s a mandolin. For some reason I always visualize my fingertip being julienned. But enough about that…. slowly at first…. 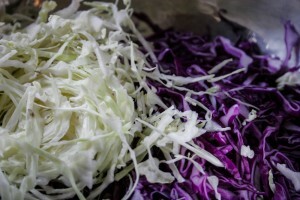 I braved the dangerous contraption and shredded the cabbage. Next I carefully… sooo carefully changed out the blades and julienned the carrots, sliced the pepper paper thin, and made the radish into something like Ruffles potato chips. They have ridges. 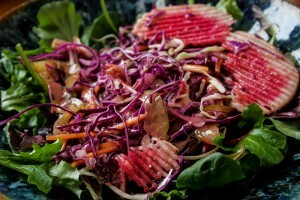 Whisk it all together, toss it with the slaw. Tada! For lunch I just took a handful of salad greens and about a cup of slaw. 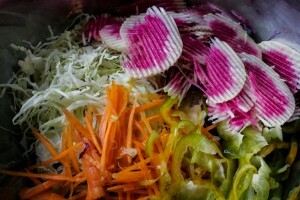 This entry was posted in Recipes and tagged farmers market, fresh, produce by Ben. Bookmark the permalink.